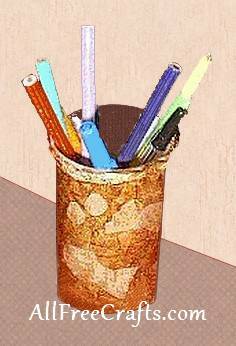 This is a recycling idea that makes a practical gift for Dad – a pencil holder with a polished finish that looks like leather! Tear off small pieces of masking tape and, starting at the top, attach them all around the container. Keep tearing and breaking off pieces, working your way down the container and all over the bottom. Draw shapes on the roll of masking tape to use as decorative accents. I used a fish and small circles for the bubbles. Cut the shapes out and stick them to the container, on top of the other pieces of masking tape. Roll a long piece of masking tape into a snake so that the sticky side is on the outside. Place that onto the top of the container as a lip. Take the brown shoe polish and rub it all over the masking tape surface of the container. With another piece of cloth, rub the container until shiny. It will look like leather. I think this is a great gift for DAD!